Today’s guest post is an image by Lee Sullivan, taken on her way home from hockey practice. 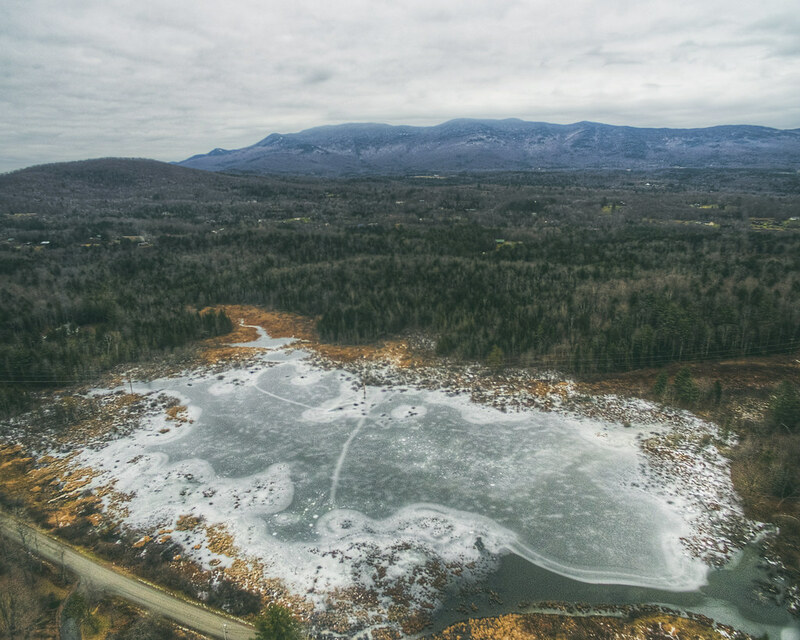 Even from high above, the evidence of winter’s arrival show in the locked-down and cracked-apart landscape of the northeastern United States. The northeastern US has been gripped by severe and hardened cold. Consider, for a moment, how much colder 20 ºF feels than 60 ºF. Imagine that difference projected past its original low point, out the other side to -20 ºF. After past winter temperatures like these, I can attest that the return to “normal” winter really does feel 40 ºF warmer. The rivers and lakes are freezing. The snow is a dry powder, dozens of degrees below its melting point. 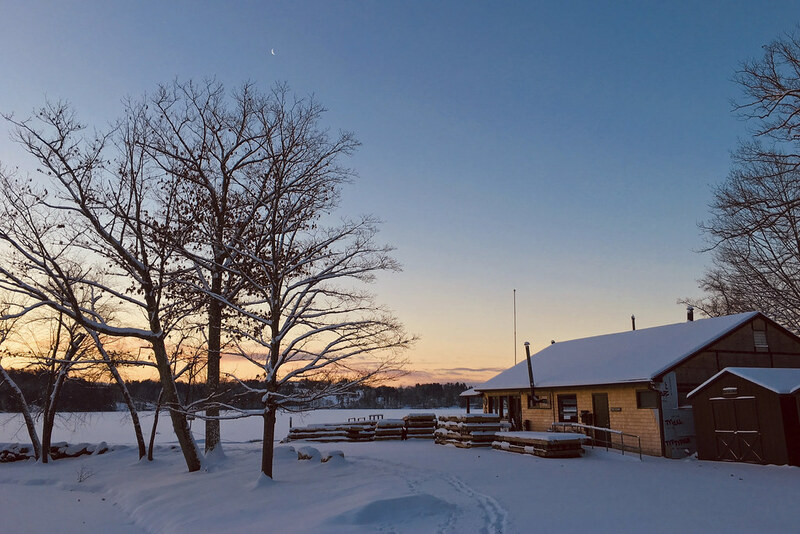 A warm home above the frozen waters sounds pretty inviting. 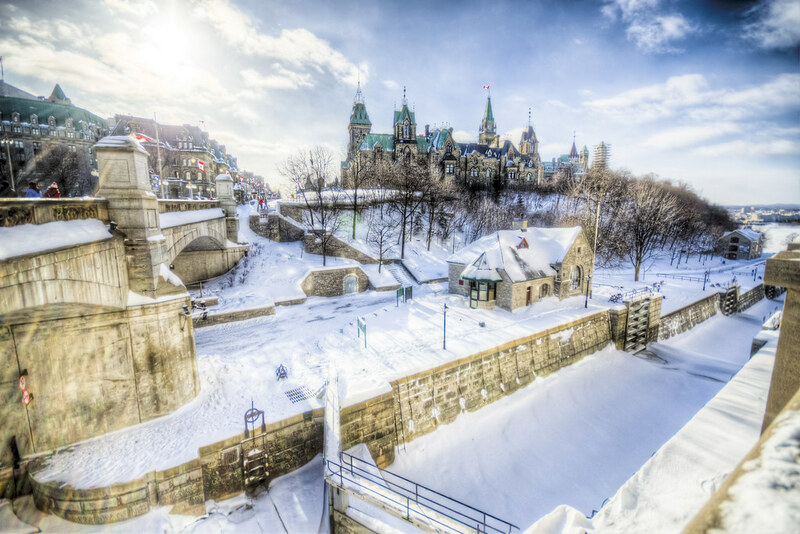 The Canadian Capital has this charming, European flair to it in the winter. Between the stone walls, steep hills, and canal locks (not to mention the bridge), I’m left waiting for a sophisticated spy thriller to begin. Today’s post comes courtesy of Colin Hill. This is a shot of Stockbridge Bowl in the town of Stockbridge, Massachusetts. It was a relatively warm day, but the lake was still frozen over. 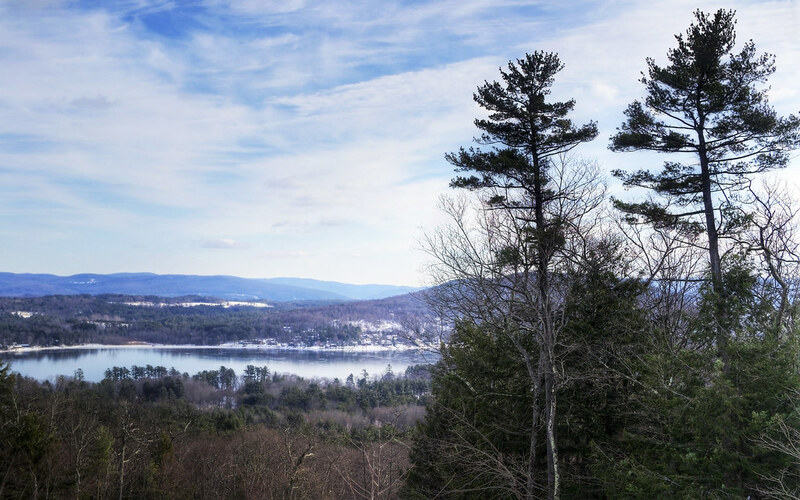 I love the details in this picture: the huge cracks forming on the lake’s surface, the snow covered houses nestled into the hillside, the hills rolling off into the distance, all watched by the two tall pines in the foreground. On the same European adventure to the alpine village of Obergurgl in Tyrol, Austria, I was out for a walk when I captured this shot of a creek running near the village in the process of freezing over. 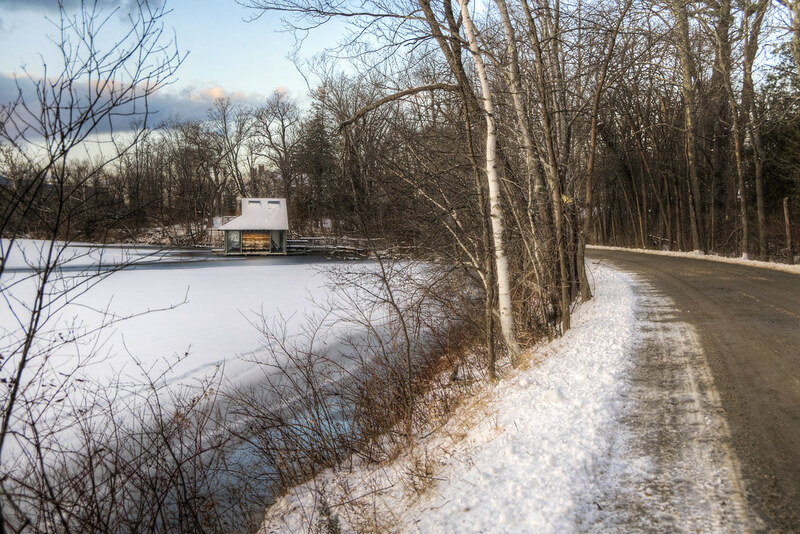 The ice is interesting to look at but the semi-abandoned outbuilding on the bank. 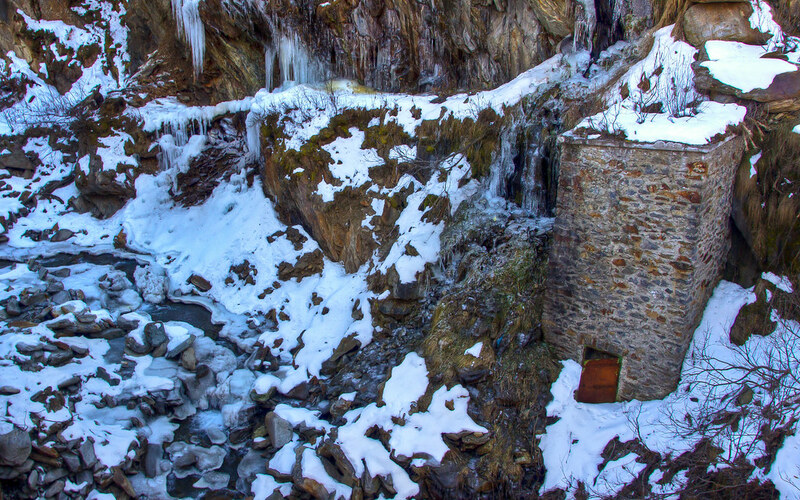 It doesn’t appear to be in active service, as evidenced by the partially ajar door, nor is there an obvious way to get down to the entrance, though perhaps without the snow and ice there’s path down the cliff face or maybe even some sort of connection to a cave in the cliff. One can only guess at what function this building does or once did serve. 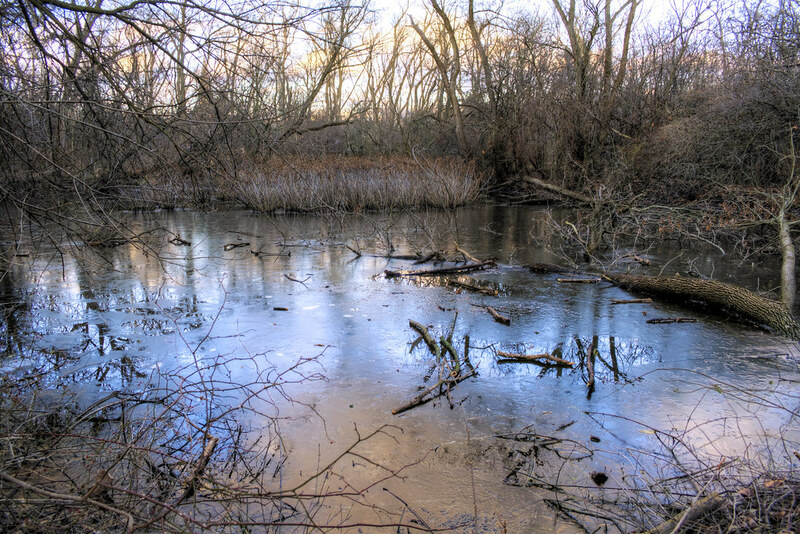 On the same day that I took this photograph, I found this awesome, half-frozen pond in the back of the forrest preserve. Though the sun was setting and the clouds were already picking up an orange-pink color, from this angle only the bluest parts of the sky were reflected. It had been above freezing for a couple of days, and the ice had melted to the point that it comprised two or three different textures. The brightness of those colors and the variations in the pond’s surface made for a nice contrast with the dormant and dead plants surrounding it.